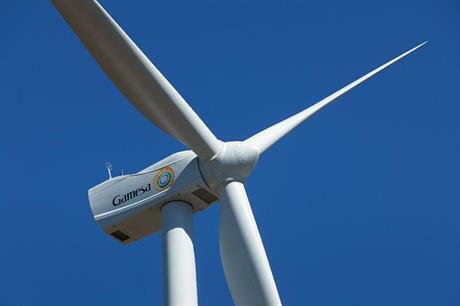 CHINA: Siemens Gamesa Renewable Energy (SGRE) has signed contracts to supply 96MW of turbines to two wind farms in China. The manufacturer will provide 24 units of its G114-2MW model for Chinese utility Datang’s 48MW Yangshugou wind farm in Liaoning province, northeast China, and 24 of its G97-2MW machines for Chinese General Nuclear Power's (CGN’s) 48MW Wohushan site in Shandong province, eastern China. The turbines for both projects will be delivered this year, the manufacturer stated. SGRE has worked with both customers before, having supplied 612MW of turbines to CGN and 295MW to Datang, it said. To date, it has installed more than 4.6GW in China, the manufacturer added. SGRE has also received an order for 11 of its G114-2.625MW turbines for Spanish oil company Cepsa’s first ever wind farm. The project in Jerez de la Frontera in Cadiz, southwest Spain will have a total capacity of nearly 29MW and is expected to be commissioned towards the end of 2018. SGRE will operate and maintain the project for five years.